I am interviewing chef Jason Atherton for the Sunday Times sometime soon and I recently realised I had a gap in my experience of his rapidly expanding gastro-universe. I had eaten at Maze when he was Gordon Ramsey’s small-plate protégé, had a memorable lunch at the Pollen St Social Club and a decent dinner at the Social Eating House (on the first full day of opening, and the debutante nerves showed a little) and a good-value lunch (£25.50) at Little Social, which for me showed Balthazar the way to do a Manhattan-influenced brasserie in London. 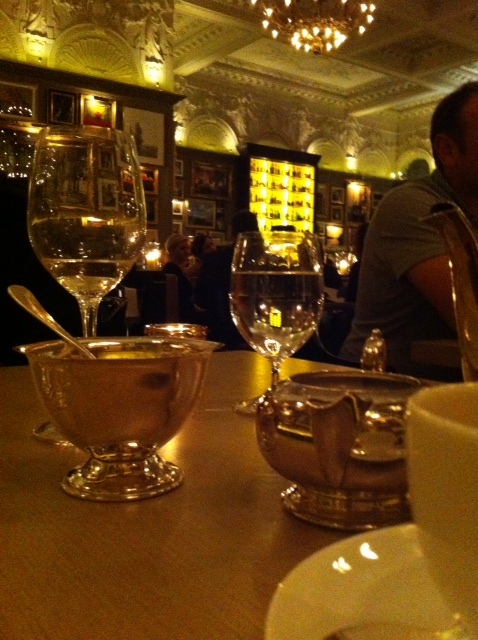 But I hadn’t eaten at his latest joint, Berners Tavern, at the new London Edition hotel, just north of Oxford Street. Time to make amends before the meeting. I used to have my breakfast meetings (a thing of the past, I’m pleased to say) there when it was the Berners Hotel, a low-key, faded five-star that clung to memories of its (distant) heyday. Now, it has been Ian Schragered – spruced and primped and Fabergé-d (look at the chandeliers) to brash, contemporary glory. Shrager’s still got that same quirk from the Royalton of trying to save on the lighting bills (maybe he’s heard about our energy companies), so there are corners of the public areas where flashlights ought to be provided, but it’s a very impressive lobby with, Schrager’s essential ingredient, a busy little bar. Oh, and that other trope of Ian’s – a phalanx of unnervingly attractive staff. You could certainly forget that, under its scrubbed, moisturized and waxed skin, this is a Marriott hotel. The restaurant is even grander, the walls covered with a Tetris of mis-matched artwork, a soaring illuminated cabinet of spirits centre-stage at the bar and a roof to remember. Nobody could tell me when the triple-height, ornately plastered ceiling dates from (although the marble floor in the foyer is apparently 1830s), but this was once the site of Messrs Marsh, Stacey, Fauntleroy and Graham’s private bank. Like all good banks, this had its share of scandal. Henry Fauntleroy was light-fingered to say the least, helping himself, with a little creative accounting and the Georgian equivalent of dodgy OTC Derivatives, to £250,000 (a very large fortune back then). According to the judge at his trial at the Old Bailey, the banker “squandered it in debauchery”. Some things never change. Well, that’s not quite true – they hanged him for his embezzlement on November 30, 1824, the last man to hang for forgery in the UK. Still, back to the food. I am not going to list the meal beat by beat in time-honoured fashion (‘We started with the soup..’). We went fishy, apart from a playful “ham, egg and peas” starter (brilliant), with perfectly cooked fish, lime-chilli scallops, baby squid and a watch-the-white-shirt squid-ink risotto. It was all executed and served with admirable precision. Prices are commensurate with the setting, mind. We paid £110 for four courses, water, tea and a reasonable bottle of Torrentes, from the lower rung of a wine list that quickly ascends to the heavens. One bugbear among the opulence, and Berners Tavern is far from alone in this, is that I don’t like those credit card machines which say, even though you’ve paid 12.5% already, ‘Would You Like To Add A Gratuity?”. It makes you feel Steve Buscemi’s Mr Pink (‘I don’t tip.. I don’t believe in it’) when you press ‘No.’ There should be a “Yes, but I’ll pay it in cash, thanks” option. Better yet, just shut up with the questions. So, the overall verdict – rolling in the whole experience, ambience and food – is that Berners Tavern provided one of my best meals out this year in what is unlikely to be topped as the most splendid setting (it certainly rivals the Wolseley in that respect). And it’s open all day. Maybe I’ll start doing breakfast meetings again. This entry was posted in Food, Travel and tagged drink, food, Travel on October 30, 2013 by Robert Ryan.